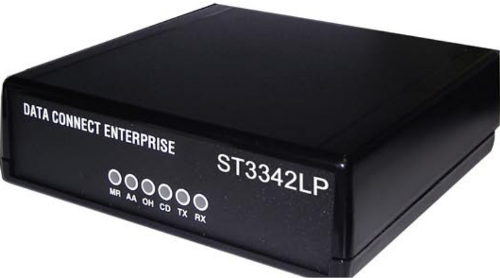 For industrial networks, data centers and remote management application that require high-speed connections, the Data Connect ST3342LP family of wire line data modems incorporates the latest advances in modem design to deliver efficient and reliable performance that is packaged for industrial and commercial applications. ST3342LP series modems offer superior price/performance and robust features set that will meet or exceed your communications needs. Complex network configuration often incorporate a variety of data set interfaces, each requiring separate modem types. The result has been a requirement to stock seldom used parts, often in significant quantity. Now, the DCE ST3342LP series offers an all-in-one solution for a wide range of applications. Packaged in either a polymer or metal case, and backed by a five year warranty, the ST3342LP series is capable of operating in either 2 or 4 wire configurations on dial up, leased line, or short haul networks. Protocol support includes V.34, V.32, V.32bis as well as Bell 212A and 103j. Physical- DB9 connector Electrical-RS-232F (V.24). Asynchronous: Auto baud or selectable format and rates to 115.2Kbps with V.34 or 57.6 Kbps with V.32bis. Standard AT compatible dials command or DTR dial of stored number. 115VAC->9VDC Wall Transformer included with all standalone configurations. Nearly instantaneous- will detect first character or ring. FCC Part 68& Part 15, Class A Optional: International approvals available. Dimensions: 5.3”L x 5.05”W x 1.53”H.